After much debate, posturing and social media fury – and what element of sports gaming doesn't trigger debate, posturing and social media fury? 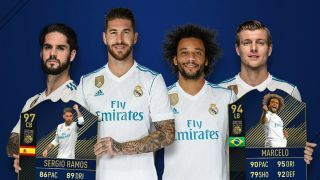 – FIFA 18's Ultimate Team Of The Year has landed, with good news for Cristiano Ronaldo, Luka Modric and Lionel Messi. Alright, those names aren't exactly surprises, particularly as the 'TOTY' was in part decided based upon community votes. But there are a couple of permanent fixtures in the team who've been ousted, at last, which in itself constitutes a mild shock. Such as Neymar and Iniesta: elbowed out of the forward line and midfield by Harry Kane and N'golo Kante respectively. As I write this, De Gea and the defenders can be found in packs, with the entire side due to be available over the weekend. Just don't go mad on FIFA Points. As I've explained countless times, you needn't spend any real money to make big in-game coin via Squad Building Challenges. FIFA 18 is out now. Looking to step up your game in order to nab one of the above cards? Then check out our essential tips and tricks from the real experts (i.e. you).